Welcome to a somewhat belated Summer issue of the newsletter. A lot has been happening in the last few months, and there is much to report on here. Remember, though, that you also have a chance to hear much more about the work to restore and beautify the church at our Annual General Meeting in November. Accompanying this edition is the notice of the date and venue. 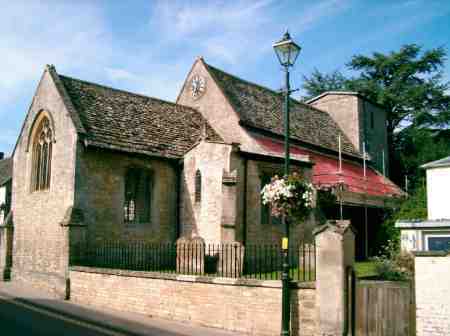 This is your chance to have a say in plans for work on the church, and to suggest ideas for how we can raise funds. Please do come along and support the meeting: you will be most welcome. 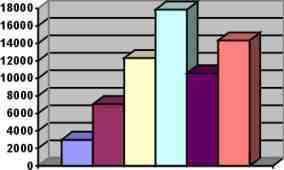 Speaking of funds, Tony Doyle our treasurer has prepared the accompanying graph showing a fairly steady growth in our funds. However it does not convey the full picture as between 2000 and 2003 we have spent a lot on the church. This is a tremendous result, and a tribute to all the hard work that has gone into fund-raising, and the generous donations from Friends and local charities that have supported our work over the last six years. 31st May saw the first of our big fund raising events for the Summer, a sale of second-hand books at the church. These had been generously donated to raise money for the church. Local press coverage (thank you Gerry) ensured a lot of interest in the sale. We held the sale in the church itself so that book buyers could get a look at the building which they were helping to preserve. It was quite a sight with a few minutes to go before the doors opened to see a queue stretching all the way back from the church door to the High Street! Once the doors opened trade was brisk, and many a bargain was there to be found. Overall just short of £400 was raised on the day. Next in the busy Summer schedule was the fete, hosted once again by Seymour and Louise Aitken at Brook House. The fete formed a part of the Cricklade Festival, and this, plus the lovely weather helped bring in the punters. A total of some £1,400 added to the funds. One new attraction this year was the St Mary's balloon race. Tickets to sponsor a helium balloon were sold in the run up to the fete and on the day. Then all the balloons with the sponsors name on them were launched at the end of the afternoon. They drifted off in a gentle breeze towards the Cotswolds. A prize was offered for the balloon that travelled the furthest and had its ticket posted back. 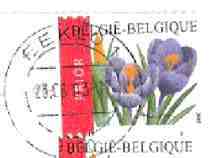 The wind must have changed direction as tickets began to be posted back to us from Northamptonshire, Bedfordshire, Essex, and then, excitingly, from Belgium. The final winner travelled all the way to Germany - some 250 miles in less than three days. In conjunction with fund-raising we aim to present the history of St Mary's. There have been two new initiatives this summer. First of all the Friends has issued a revised short history of the church. It now includes historical notes on both the church and the local Catholic community. Three local artists have provided illustrations. This 19-page booklet is on sale in the church, at the Council office, and at 'Scissors', the hairdressers in the High Street, at a very modest £1. Please do get in touch with the committee if you are aware of any other local outlets who might want to sell the booklet on our behalf. Also the Friends of St Mary's web-site goes from strength to strength. David Tetlow, our web editor has recently launched a 'virtual tour' of the church and churchyard. Visitors to the web site are guided round the church with explanatory text supplemented by new photos of the church. One advantage of a virtual tour is that you can go to bits that are not easily reached in the 'real' world. So for an opportunity to see what the clock mechanism in the bell-chamber looks like (or indeed our new central heating boiler) there is no longer a need to clamber up the Victorian iron ladder in the tower - just point your Internet browser at http://welcome.to/friendsofstmarys. Formal open days have been held this Summer alongside the fundraising events, and also, once again this year, as part of Heritage Open Days weekend on 13th September. In addition committee members have been active in giving talks to local and visiting groups. We were happy to host visits from the local Women's Institute and from the English Catholic History Association, both of whom made generous donations in return for tours and talks at the church. A new Visitors Book in the church invites comments from visitors. Open Church policy - a way forward for St Marys? On the subject of visitors, the Friends, in association with other local churches, hosted a very interesting seminar on the subject of church security on September 17th. Nick Tolson from a group called National Churchwatch (www.nationalchurchwatch.com), and Ian Giles from Ecclesiastical Insurance gave a thought-provoking presentation on how churches can be opened safely and securely. The message was that, with some fairly basic precautions, it was often best for a church to remain open to visitors during daylight hours. Advertising the fact locally could mean that any potential burglars or troublemakers would actually be put off. They would not know when someone else might drop in, whereas if the church was locked, and they broke in, they could be assured that they would not be disturbed. Although much has been achieved with the money raised by the Friends, there still remains much to be done. Two projects are in hand. The first of these is repairs to the roof over the North aisle. At its most recent meeting the Friends committee agreed to commit the greater part of available funds, some £11,500, towards the cost of this repair work made necessary by structural movement of the North wall some years back. The roof is being stripped and specially made ties inserted into some of the timbers to reconnect the roof-trusses to the wall. Additional insulation is also being added to the roof before the stone tiles are replaced. The other project in hand is work on the North chapel. It is hoped that a plan for work proposed will be available shortly - perhaps at the Annual General Meeting, but in essence the screen at the front of the North aisle will be moved into the archway that leads into the chapel. The chapel itself will then provide the confessional for the church, plus some additional storage. There are also plans for a commemorative stained glass window to go in the small East window of the chapel. This would be dedicated to St Augustine, to commemorate both the meeting that he held near Cricklade some 1400 years ago, and in honour of the dedication of the former chapel in Calcutt Street (now the town museum) which was previously home to the Catholic congregation. In addition the quinquennial survey highlighted further urgent repairs which, with other repairs needed in the next two and a half years, will cost about £5,600. Add to that the need for repairs on the churchyard cross and you can see that there is still a long way to go. In this context it is sad not to be able to report any progress with fund-raising under this tax credit scheme. You will recall earlier in the year the Friends holding an Extraordinary General Meeting specially to be able to register under this scheme, by which land-fill operators can fund environmental improvement schemes (including restoration projects) and receive tax allowances. So far this route has proved fruitless, as local landfill operators have proved reluctant to support us. If you know of anyone who might be able to help in this way, do get in touch. The Friends of St Mary's has been approved as an 'Environmental Body' by the group that administers the scheme (ENTRUST), but without support from the land-fill operators there will be no funds forthcoming from this source. A call from the committee for new members! The Friends very much welcome new applicants to join the committee and help us with organisation and fund-raising. The duties are not onerous, its good experience, and the cause is a worthy one. So, if you have energy and a little time to commit, do get in touch with anyone on the committee. The Annual General Meeting in November is your chance to step forward and roll up your sleeves. And one final note from your Editor... After five issues I am keen to step down as Newsletter Editor, so as to be able to concentrate on ENTRUST and other heritage sector grant applications for St Mary's. If you or someone you know would like to take on this role, please do get in touch. Can I also thank the Friends committee and all of those who have assisted in submitting articles about the church and suggesting ideas over the last few issues.